England’s game with Brazil on Sunday has been SUSPENDED after a court ruling that the Maracana Stadium is unsafe. Wayne Rooney and Co arrived in Rio to be told that the 2014 World Cup final venue did not have the necessary safety certificates. A local judge ordered the suspension after the state prosecutor highlighted safety concerns such as piles of debris and building materials around the ground that could be used as missiles in the event of crowd trouble. 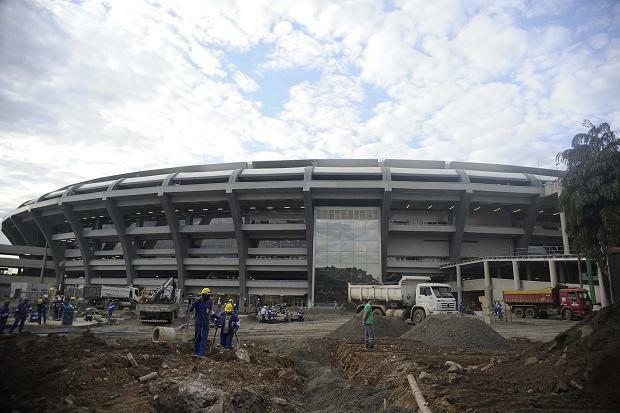 The shock came as builders swarmed over the site yesterday attempting to finish work ahead of Sunday’s game — a key test event for next year’s World Cup finals. Turnstiles were still being installed and scaffolding was still in place at the ground. 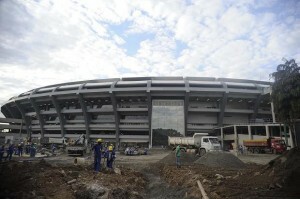 Even if the match goes ahead, this farce casts huge doubts on Brazil’s ability to host the finals. The iconic Maracana, which has a 79,000-seat capacity, was reopened just a month ago after a two-year, £286million re-build. A test event took place at the end of April for local construction workers. But a second run-out was cancelled to allow further technical tests. The Brazilian FA is expected to fight the decision today, claiming they do have the relevant safety papers. The decision was made as Roy Hodgson’s England players took to Copacabana beach for a training session. An FA source, in agreement with FIFA, said the England camp was confident the game would take place. Last night the State Government of Rio joined in the row. They released a statement, saying: “All security requirements for the Brazil v England friendly have been met.